A 2013 protected bike lane demo in Minneapolis. Image: Bikeways for Everyone. A practice that began as guerrilla activism and was later embraced by professionals as “tactical urbanism” — using live on-street demos to test the effects of changes to city streets — hit a milestone last week. For what seems to be the first time ever, a live on-street demo of a protected bike lane has been funded by a state transportation department. The $10,850 grant from the Maryland Department of Transportation, announced Sept . 29 as part of a $15 million grant cycle, is a sign that the on-street demo is becoming a common step in the process of planning street redesigns. It’ll pay for a weeks-long test of planter-protected bike lanes on East Pratt Street in Baltimore. Annotations from Baltimore’s plan for a pop-up lane. Doolin wrote the grant application for the project, taking advantage of an MDOT program designed for low-cost active transportation improvements. Many cities want to build pop-ups, she said, but end up throwing staff time into elaborate fundraising plans because pop-ups don’t fit into the traditional model of planning something completely on paper — and sometimes in little-attended public meetings — before building anything on the street. “The cities that want to do these pop-ups but can’t are getting basically volunteers or sponsors to pay for them,” Doolin said. Kate Sylvester, an MDOT project manager who approved Doolin’s grant, said better public outreach is a big virtue of the pop-up proposal. A 2014 pop-up in Mountain View, California. Photo: Great Streets Mountain View. In the case of the Pratt Street project, the pop-up protected bike lanes would run on five blocks between South Central Avenue and South Broadway, past a supermarket, two schools and Perkins Homes, one of the largest low-income housing developments in the city. Doolin said 10 percent of the project funds will go to direct outreach to Perkins residents and other people in the immediate area. Pratt is a one-way, three-lane street. On off-peak hours, its two curbside lanes become parking lanes. But Doolin said that the requirement to move cars during peak hours is rarely enforced. “You literally see kids playing with their bikes in the street between the sporadic parking in the peak hour,” Doolin said. 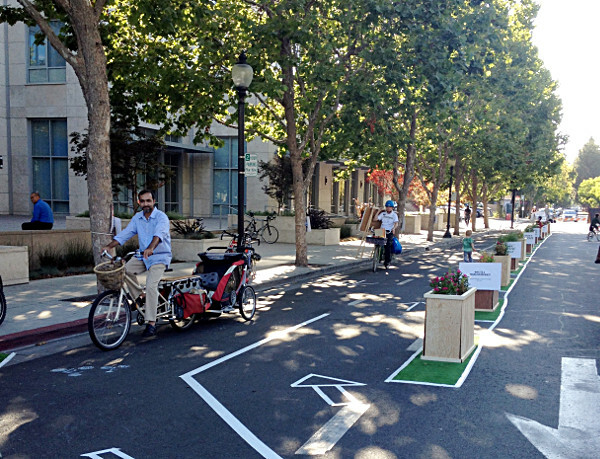 Doolin’s pop-up would keep the southern curbside parking lane while converting the northern curbside lane to a two-way bike lane protected by planters. A simple rendering by the City of Baltimore of a planter-protected bike lane on Pratt. Doolin’s proposal included photos from similar pop-ups in Minneapolis and Oakland. Sylvester said that if the Pratt project works, she hopes other Maryland cities will be able to follow Baltimore’s example and use their own pop-up tests to build out the state’s biking network. “I think it’s really going to help people envision Pratt Street as an east-west for something other than cars,” Doolin said.